Years ago my friend Susan taught me how to make garlic bread that was not only delicious, but so incredibly easy it's virtually fool-proof. * In fact, were it not for my friend Jen requesting a profile of this technique, I'm not sure I would have ever remembered to share. After you make it a time or two, hopefully you'll fold it into your routine as well. 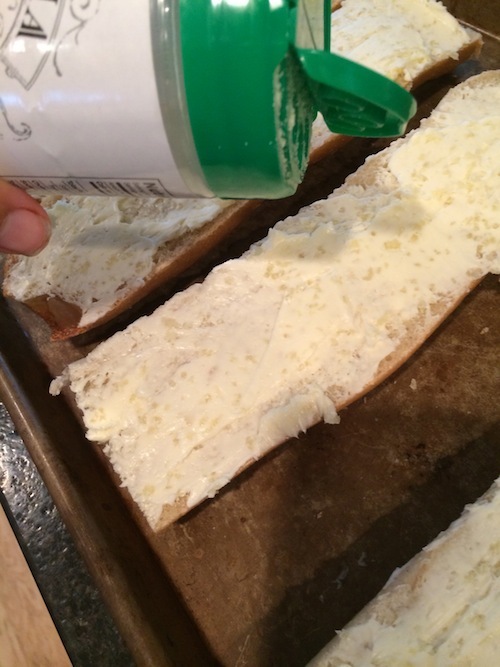 Divide the baguette in half.Put the garlic into a press and add to the softened butter. Mash together thoroughly so the garlic is evenly incorporated.Spread evenly onto the bread, making sure you get the mixture to the edges. Put the bread on a cookies sheet for baking.If you don't mind the calories or sodium (and I don't!! ), sprinkle with Parmesan cheese before putting in the oven. I don't always have the good stuff handy, so I'll use the kind from the jar and it works just fine. #3 AVOID multitasking during toasting. PLAN on spending 3-5 minutes staring into the oven. #4 BEST solution - when one of your guests asks, "How can I help?" given THEM the assignment of watching the bread. If you're like me and prone to distraction, your company will do a better job finishing this project! That's how I achieve the results in the picture below!Serve with your favorite meal. Enjoy! !